Welcome to my own version of Hell. I feel like Sisyphus, except for the part where I’m being punished for being deceitful, that is. The gods had condemned Sisyphus to ceaselessly rolling a rock to the top of a mountain, whence the stone would fall back of its own weight. They had thought with some reason that there is no more dreadful punishment than futile and hopeless labor. For the past month, except for a brief few days camping and hiking in Pinnacles National Park, I’ve been cleaning and re-cleaning and cleaning again. First we had five trees removed and I cleaned the yard of debris. Now we’re having our roof replaced in advance of the forecasted horrible, terrible, El Nino this winter pouring rain down upon our droughty lands. The last time our roof was replaced was in 1985, prior to purchasing this house. No one prepared me for the MESS and the NOISE. Tearing off the two older iterations of roofing shingles. Dirt, dirt, and more dirt IN THE HOUSE. Even with all the windows closed in this one-hundred degree heat. This is the stuff of OCD night terrors, because I JUST CLEANED IT. Dirt on the screens, in the window tracks, coming in through the vents. And there’s me, the embodiment of Sisyphus, vacuuming and vacuuming and well, you get the picture. Are you asking yourself why don’t I simply wait until it’s all over and clean it just one time? I’ll give it some thought and get back to you with an answer as soon as I finish vacuuming. See what I mean about Sisyphus? 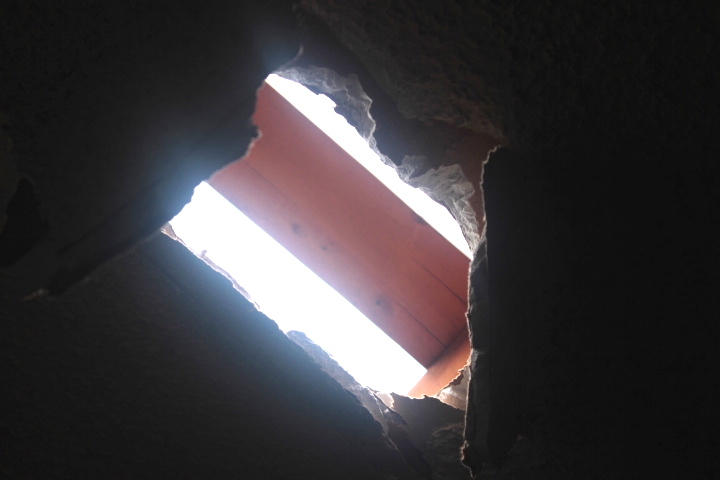 OMG and then this HAPPENED right now as I’m writing this…a roofer stepped through and crashed into the ceiling in the office. Now I am officially CRAZY.